At Roys, we consider ourselves a part of the community around all of our stores. We engage with the local area & do all we can to help wherever possible. After all, it's our customers & staff that have kept us going for over 100 years so it is our privilege to give something back to the communities. We are inundated with requests from clubs, groups, charities, schools and many others asking for raffle prizes and products for events, last year we managed to help 65 schools, 15 Churches & over 150 local charitable events. 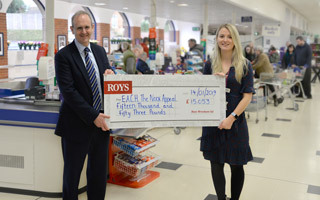 Throughout 2018, Roys (Wroxham) Ltd was able to donate over £32,000 in the way of 5p carrier bag sales, donations from the Making a Difference Locally Fund (MADL) and raffle and product donations. Roys charity of the year 2018 E.A.C.H. received over £27,000 from the sale of 5p carrier bags, this money will be used to help continue the construction of The Nook, a new children’s hospice for Norfolk situated in a five-acre woodland site in Framingham Earl, five miles south of Norwich. The nook will transform children’s palliative care for Norfolk, helping EACH meet the increased demand for their services. E.A.C.H. have been a very deserving charity and Roys are very happy they have been able to help such a worthwhile cause. 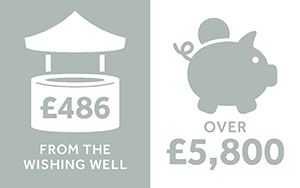 This March Roys have made over £1,000 worth of donations to 45 different charities & good causes. £750 of the money donated was through our Making A Difference Locally fund however the majority of the causes helped were from raffle prize requests for events that will hopefully raise even more money. We're also proud to say that many of the causes donated to were local charities or groups. Roys have donated £500 to Coltishall & Horstead Preschool to help them with their project to improve their sensory garden. 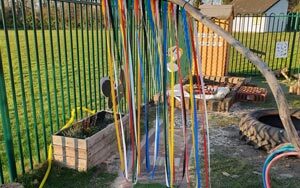 The money has helped them to build a sensory path which is accessible to wheelchairs, add a new storage shed, music area, bird table & sensory plants. 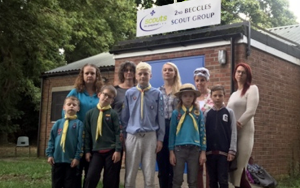 Last year 2nd Beccles Scout Hut was broken into and over £10,000 worth equipment was stolen. 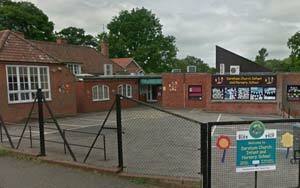 The items stolen included archery equipment, stationery and several tents. The scout group approached us towards the end of last year to ask for a donation and Roys is happy to have donated £250 towards replacing the equipment and improving the security at the hut. Recently the Dereham Church of England Infant School contacted Roys asking if we could help with the cost of replacing the school roof. The roof has been leaking for some time and in various places, resulting in frequent repair bills. Replacing the roof will cost around £200,000 and despite a grant from the Department of Education it is still something they cannot afford without fundraising and Roys is happy to have donated £500 towards the replacement. This week Roys will be sending out donation cheques to charities totalling £5816! 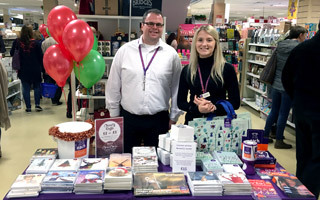 The money has been raised through in-store events, collection pots and staff fundraising throughout 2018. Seven charities will receive a donation including East Anglian Air Ambulance, Nelson’s Journey, Save the Children, Each and Cancer Support UK. The wishing well located in Roys of Wroxham food Hall has been emptied and counted and due to the generosity of our customers we are able to donate £435 to East Norfolk riding for the disabled! 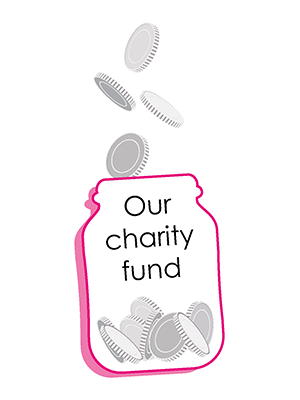 This January Roys have made over £500 worth of donations to 28 different charities & good causes. Over half the money donated was through our Making A Difference Locally fund however the majority of the causes helped were from raffle prize requests for events that will hopefully raise even more money. 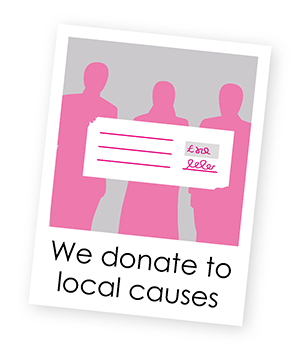 We're also proud to say that 23 of the 28 causes donated to were local charities or groups. 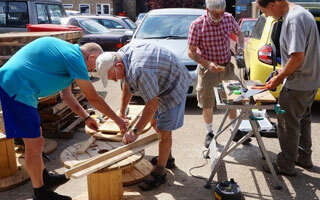 Dereham Men's Shed aims to combat loneliness and isolation by providing a meeting place for men to come together, socialise and pass skills onto each other. They keep their membership fees as low as possible to avoid excluding anyone and so rely on the support of local charities and businesses to help fund the project. Roys' £100 donation comes from our MADL (Making A Difference Locally) fund and will help with the day to day running of the group. Roys have donated £250 from our MADL (Making A Difference Locally) fund to Asperger East Anglia after they approached us as part of their recent fundraising campaign. 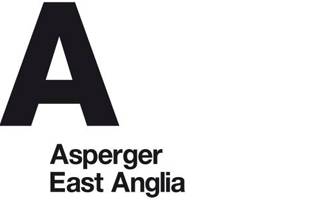 The charity, which supports people with Asperger Syndrome and provides social groups in Norwich & Beccles has no funding support and was at serious risk of closure. We were so proud to start the year off with a donation of over £15,000 to the EACH Nook Appeal, our charity of the year last year. This donation brings the total up to £27,377.87! We are so thankful that we were able to raise this impressive sum and to pass it to such a worthy cause. This year each of our stores have chosen their own charity, we hope we can make a difference in the communities all over Norfolk & Suffolk. 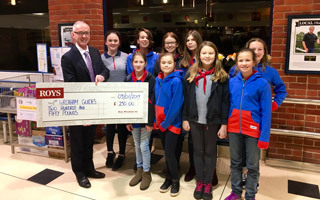 It was our pleasure to donate £250 to the 1st Wroxham Guides to help with purchasing the new Guide Meeting Activity skill cards and books, which are required on the new Girlguiding programme. The pack covers six different learning zones, including ‘Take Action’, ‘Skills for my Future’ and ‘Have Adventures’. 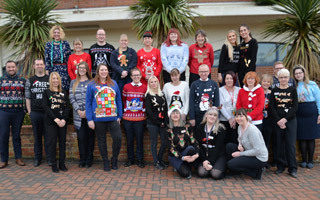 Friday 14th December is Christmas Jumper Day and the staff in our Wroxham stores and office were happy to do their bit in a festive knit to help raise money for charity. Money raised will go to East Anglian's Children's Hospices, Roys charity of the year 2018. Roys Christmas Shopping Evening was held on Tuesday 14th November. The culmination of the evening was the charity raffle, which raised £1,054 for East Anglian's Children's Hospices. Over 50 prizes with a combined value of over £3000 were available to be won and there were many happy winners. MADL (Making a difference locally) is a charity organisation that we've partnered with to support good causes in the local community. They help us to raise money which we donate to local charities and good causes in the community such as schools, churches, children’s groups, environmental projects and much more. In 2018 £2725 was donated to causes like these, helping Roys give something back to the local communities that have supported them for the last 124 years. 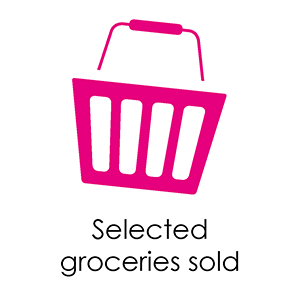 Donations are made into our charity fund based on the sales of selected grocery products as indicated in our leaflets. Roys then donate money from this fund to local charities and good causes. In 2019 Roys will have 10 Charities of the year rather than one, this will lead to more charities benefitting from the donations. Roys will also continue to donate to other charities and groups with the MADL fund and try to help with as many other requests as possible. We understand that behind every diagnosis are people and families who need help. We will support those affected by blood cancer, and their family and friends, through the physical, psychological and financial uncertainty that lies ahead. Our vision is that every bereaved child in Norfolk will look forward to a positive future, and feel empowered enough to reach their full potential. Our ambition is perhaps best summarised by our strap line: bringing back smiles. East Anglian Air Ambulance is a charity providing helicopter emergency medical service for the people of East Anglia. Since our launch in 2000 we have attended over 24,000 lifesaving missions, touching the lives of many thousands of people. We are building a new hospice in a fantastic five acre woodland setting. It will be much closer to local services, hospitals and road networks. Once built it will transform our care to meet the changing needs of children and help us meet the increasing demand for our services. SERV Norfolk is run entirely by unpaid volunteers who receive no financial compensation. All costs are met entirely by donations from members of the public, fundraising events and corporate sponsorship. We are dedicated to the fight against cancer and its effect on the individual and the family. We promote partnerships which will develop first class cancer research and services. We will become the go to organisation for Norfolk & Waveney for cancer support and information services. Muscular Dystrophy UK is the charity bringing individuals, families and professionals together to fight muscle-wasting conditions. We were founded in 1959 & have been leading the fight against muscle wasting conditions since then. We are a team of volunteers that help rehome animals. Some animals go out to foster homes where they are cared for until a permanent home is found. It’s our passion to promote the wellbeing of animals to our local community. ASD Helping Hands will support all service users affected by an Autistic Spectrum Disorder. We actively champion the rights of people affected & aim to make a positive difference to their lives while delivering a service that is accessible, reliable and trustworthy. These donations are made possible by the 5p carrier bag charge. The vast majority of money raised for these good causes comes directly from sale of our carrier bags, so every time you buy a carrier bag in one our stores you're helping a great charity! To be considered for the MADL fund or to ask for a raffle donation please contact enquiries@roys.co.uk telling us a bit about your charity or project and how you would like help.